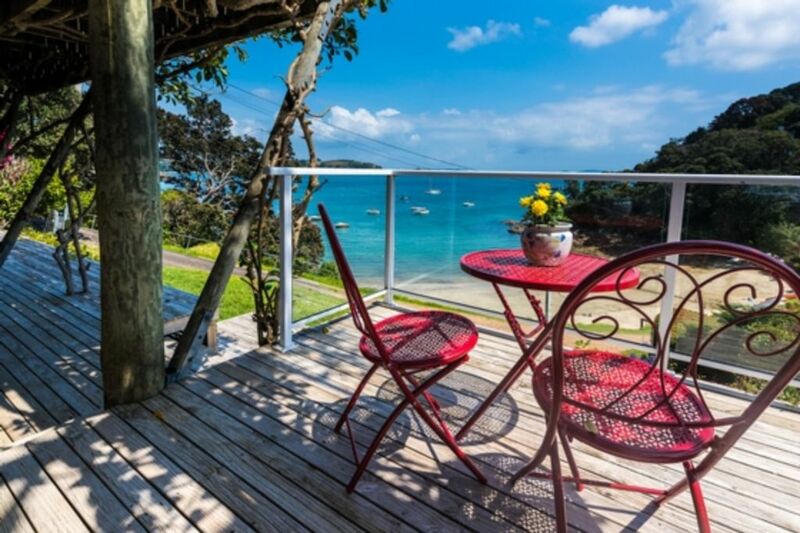 Golden Sands is a wonderful, north-facing holiday home which offers the rare combination of panoramic views of Sandy Bay and the Hauraki Gulf, with direct beachfront access to secluded Sandy Bay. Relax on the sun-drenched deck and watch your children play on the safe, sandy, all-tide swimming beach at the bottom of the driveway. No busy roads here! Kayaks and a dinghy are available (upon request) so that you can enjoy a spot of fishing or a peaceful row around to Hekerua Bay. There are also two E-Bikes plus helmets available at the property - a great and eco-friendly way to get around the island! A therapeutic haven year-round – a special place to unwind and recharge. Perfect for 3 couples or 2 families with 2 children each. More people are an extra $40 per person per night. 3 nights minimum booking over long weekends. 7 nights minimum booking over Christmas New Year (Dec 20 - Jan 10). Sunday to Thursday night, available to book anytime except during long weekends and Christmas New Year. Friday andamp; Saturday nights only available to book at the earliest, during the week beforehand. For 1 night stays please apply through our office. Thanks for letting us know about the smoke alarm. We will move it further away from the kitchen. Richard was very helpful on check in. Great spot, house very well equipped. House was spacious, and clean. House was spacious, and clean. A lot of mozzies. Great views. Driveway was very steep and tight for car, bushes need to be cut back. Beds very comfortable. The beach in particular is a lovely bay, we encountered sting rays. Had Wi-Fi. Kitchen has a cupboard that's like a tardis. We enjoyed our stay here, we got married on sandy bay beach and had a lovely reception at the waiheke resort palm beach. We left a white/cream top behind, hope we can have it returned if found. Great location and the kitchen facilities are fantastic and our boys loved biking into town every day on the Ebikes. The only downside for us was the driveway being narrow due to hedges either side so not suitable for SUV's or our VW Amrok. Wouldn't stay here again due to that reason and bringing a jetski but would recommend to others with smaller car as the house has everything you need and more. Many thanks for the information about the driveway. The owners have taken this on board and have cut back the hedges to make sufficient room for large cars to now pass comfortably and without risk of being scratched. We have tested with the a wide SUV. We appreciate your feedback. If I have to say anything I think there should have been body wash in the bathrooms . If I have to say anything I think there should have been body wash in the bathrooms . And there was a wasp nest under the bottom deck. Thank you for letting us know about the wasp nest. We will have it removed right away. Property was clean had everything we required, lovely and quite and peaceful with exceptional views the only problem was leaving it behind.